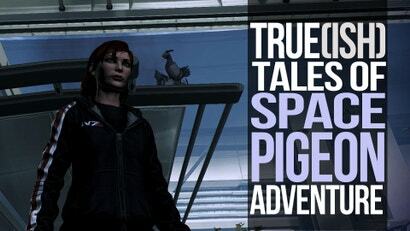 With all of this focus on Mass Effect 3's more human failings, it's easy to overlook the true heroes of this epic space adventure: the pigeons that traveled to the farthest reaches of the galaxy, spreading their universal message of "give us food or we'll poop on you". How did these brave birds make it to the Citadel? Some would have you believe these space-faring fowl aren't real pigeons at all. They'll point out the majestic crest atop the creatures' heads. Perhaps they'll suggest that these are a form of quail. To these people I say poppycock. Who ever heard of space quail? That makes absolutely no sense whatsoever. 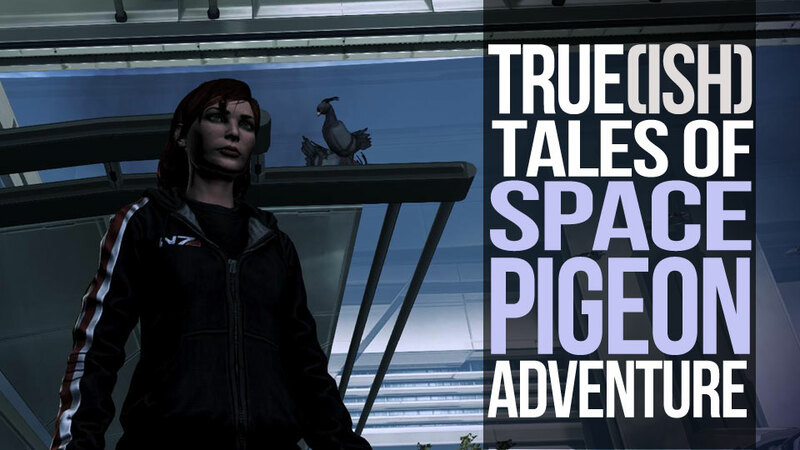 No, these are pigeons on the Citadel, the massive piece of ancient technology that serves as the central hub of the various galactic governments in BioWare's Mass Effect series. They flock where the humans, Asari, Greglocks (might have made that one up) and Tauren (wrong game) gather to eat and shop, eagerly pursuing any stray bits of food that might drop their way. I've a feeling that even if the Citadel to suffer some sort of massive attack they'd still be there, warbling away. In order to understand where these pigeons came from, we must leave the safe and secure realm of fact behind and travel deep into the realm of illogical speculation. There are several schools of thought on the matter. The Romantic Adventure: The most popular theory is that Earth's pigeons were driven by enhanced sanitation protocols to leave the planet, setting off on an epic journey across the universe in search of a space town as filthy as, say, Philadelphia or New York. Scholars envision great flocks of these glorious creatures floating through space, heads covered with tiny helmets, each linked to the helmet of another in order to facilitate noisily regurgitating food back-and-forth between each other's mouth. Humanoid adventurers speak in hushed tones about the alabaster trail, the legendary undulating mass of linear pigeon droppings floating in the void, marking the passage of the great pigeon pilgrimage. The Practical Joke: Smuggling pigeons onto the Citadel seems to be the sort of thing a character voiced by Seth Green would do. What's his motivation? I'd wager he got tired of the alien races of the floating city in space comparing him to the Samuel L. Jackson character from M. Night Shyamalan's Unbreakable. Science Gone Awry: More likely that the previous two theories, ancient Earth records indicate that humans enjoyed putting these proud pigeons into zero gravity situations, giggling to themselves as the birds became disoriented and attempted to fly upside-down. These scientists unwittingly brought about the proliferation of pigeons throughout the universe by training them how to function in weightless conditions. What about airless conditions, you ask? What are you, a scientist now? Sit down and read the story, Einstein. Pigeons Happen: The final theory isn't so much a theory as it is a universal truth: Pigeons will happen. The how, why, or when doesn't matter; they'll be there when they are unneeded. 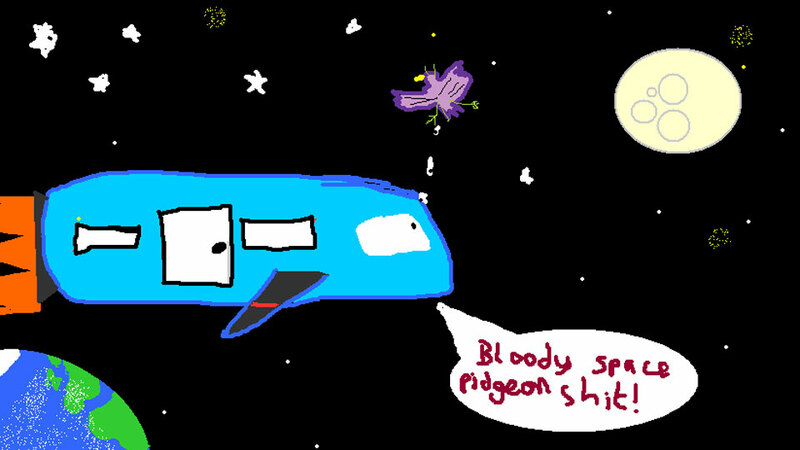 This theory is perhaps best illustrated in DeviantArtist Eddbeard's masterpiece, "Space Pidgeon". BioWare's Take: Sadly BioWare did not respond to my inquiries before this issue went to print (editor's note: We're a website, Fahey). I suspect that there might be pigeon-related DLC in the works. It might even be on the disc. You'll probably hate the ending. Ending controversy be damned, this is the true game destroying plot hole. Probably conveniently ignored by all the Biodrones while they use the ending as a smokescreen. i think if you talk to the VI in the commons, it says the area was made to feel like earth. that helps explain the pigeons. This is funny. I just assumed they were there because it was the humans turn to decorate the presidium and they wanted it to be as park-like as possible, but this is way for fun. Thanks for taking my mind of the terrible endings for a few minutes.